We, the undersigned, are supporters of The 693 Madison Street Tenants Association and demand that Isaac Hirsch and JIH Builders cease all forms of tenant harassment. In 2017, JIH Builders became relentless in their effort to push out low-to-middle income tenants out of 693 Madison Street in order to rent to people with higher incomes. While many tenants did leave, several tenants chose to resist and formed The 693 Madison Street Tenants Association. The 693 Madison Street Tenants Association is demanding that Isaac Hirsch and JIH Builders immediately end the mass evictions and all forms of tenant harassment! Tenant Harassment is against the law! For example, JIH Builders has targeted one Black family which includes a grandmother, an infant, and a toddler. The family are long-time Brooklyn residents who moved to 693 Madison Street three years ago. Despite multiple attempts to pay their June and July 2017 rent online, through credit cards and by cashier check, Isaac Hirsch refused to not take their payments. Instead, JIH Builders falsely took this family to court in August 2017 for non-payment. 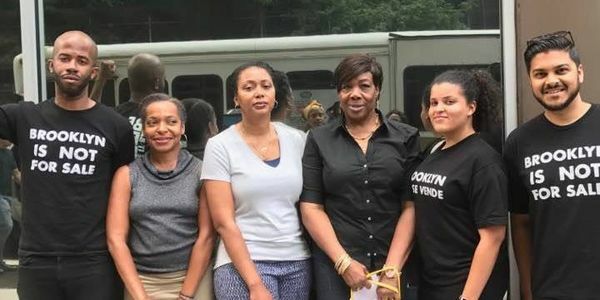 We the undersigned stand with The 693 Madison Street Tenants Association and demand JIH Builders cease all tenant harassment and the mass evictions. ​Thank you everyone for your calls & emails! Urgent Action Alert:In freezing temperatures, the tenants at 693 Madison Street in Bed-stuy have endured living without hot water since Friday December 29th . There is at least one household with small children in the building ! This is tenant harassment which is a crime!